From: The History of Sumatra: containing an account of the government, laws, customs and manners of the native inhabitants, with a description of the natural productions, and a relation of the ancient political state of that island. London: Thomas Payne & Son, 1784. Although the Sumatrans live, in a great measure, upon vegetable food, they are not restrained, by any superstitious opinion, from other aliments, and accordingly, at their entertainments, the flesh of the buffalo, goat, and fowls, are served up. Their dishes are almost all prepared in that mode of dressing, to which we have given the name of curry, (from an Hindostanic word) and which is now universally known in Europe. It is called in the Malay language, goolye, and may be composed of any kind of edible, but is generally of flesh or fowl, with a variety of pulse and succulent herbage, stewed down with certain ingredients, by us termed, when mixed and ground together, curry powder. These ingredient are, among others, the cayenne or chili pepper, turmeric, lemon grass, cardamoms, garlic, and the pulp of the coconut bruised to a milk resembling that of almonds, which is the only liquid made use of. This differs from the curries of Madras and Bengal, which have greater variety of spices, and want the coconut. 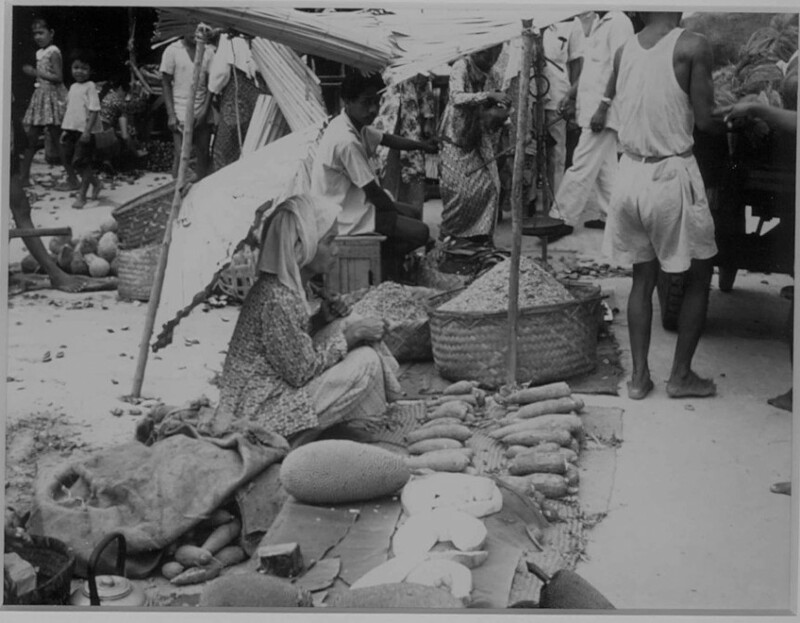 It is not a little remarkable, that the common pepper, the chief produce and staple commodity of the country, is never mixed by the natives in their food. * They esteem it heating to the blood, and ascribe a contrary effect to the cayenne; which, I can say, my own experience justifies. 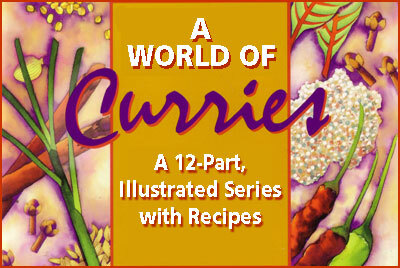 A great diversity of curries is usually served up at the same time, in small vessels, each flavored, to a nice discerning taste, in a different manner; and in this consists all the luxury of their tables. Let the quantity or variety of meat be what it may, the principal article of their food is rice, which is eaten in a large proportion with every dish, and very frequently without any other accompaniment than salt and chili pepper. It is prepared by boiling in a manner peculiar to India; its perfection, next to cleanness and whiteness, consisting in its being, when thoroughly cooked and soft to the heart, at the same time whole and separate, so that no two grains shall adhere together. The manner of effecting this, is by putting into the earthen or other vessel in which it is boiled, no more water than is sufficient to cover it; letting it simmer over a flow fire; taking off the water by degrees with a flat ladle or spoon, that the grain may dry, and removing it when just short of burning. At their entertainments, the guests are treated with rice prepared also in a variety of modes, by frying it in cakes, or boiling it, mixed with the kernel of the coconut and fresh oil, in small joints of bamboo. This is called lemmang. Before it is served up, they cut off the outer rind of the bamboo, and the soft inner coat is peeled away by the person who eats. In 1784, the chickens used in this curry were an actual Indonesian variety of chicken that was called the Sumatra. It has a vaguely pheasant-shaped body and it was imported into the U.S. in 1847. In the beginning these birds (armed with steel spurs) were used in the cockfighting circuit as purebred fowl or were crossed with American birds. Heat the vegetable oil in a wok or sauce pan and fry the onions until they start to turn brown. Add the ginger, garlic, chile, lemongrass, and spices and stir around for about 1 minute then add the salt and pepper. Add the water and the tomatoes and bring the sauce to the boil then reduce the heat and simmer for 10 minutes. Add the chicken pieces and stir well. Cover the pan with a lid and simmer the chicken and sauce for 30 to 40 minutes. Turn the pieces every 10 minutes to ensure they are evenly cooked. To finish add the yoghurt and stir into the curry so it is evenly distributed. This will thicken the sauce. Cut the lime in half and squeeze both sides into the pan and stir again. The curry is now ready to serve. Finely slice the bunch of coriander leaves and sprinkle over the served curry, then serve with cooked white rice.